Former major league baseball player Barry Bonds goes on trial Tuesday for allegedly lying to a jury about using steroids. 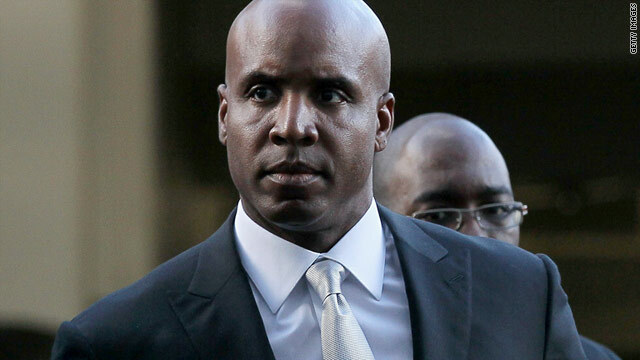 San Francisco (CNN) -- Barry Bonds' personal trainer refused to testify against the baseball home run king in his perjury trial Tuesday, prompting the judge to order the trainer held in custody until he changes his mind. Federal prosecutors called Gary Anderson as the first witness as they began laying out their case against Bonds in a San Francisco courtroom Tuesday morning. "It's very important that you testify so that the whole truth can some out in this trial," U.S. District Judge Susan Illston told Anderson, as she found him in civil contempt. Geragos said he would immediately appeal the judge's decision to send Anderson to jail on the grounds that he was not given a fair hearing. Anderson has already served several months in prison for previously refusing to testify against Bonds before grand juries in 2006. He also was sentenced to three months in prison after pleading guilty in 2005 to illegally possessing anabolic steroids with the intent to distribute. "He doesn't trust the prosecution," Geragos said of Anderson. "He will never cooperate with these guys." The trial, which is expected to last three or four weeks, is taking place less than two miles from the ballpark where Bonds, 46, broke Henry Aaron's major league home run record in August 2007. Bonds, then a star on the San Francisco Giants, was indicted three months later on four counts of lying to a grand jury about his use of performance-enhancing drugs during the federal investigation of steroids use by athletes. He also faces one count of obstruction of justice. Prosecutors will try to convince a jury of eight women and four men that Bonds knew his trainer was giving him illegal steroids and that he lied about it to a grand jury in December 2003. Assistant U.S. Attorney Matthew Parrella told jurors that a urine sample given by Bonds in the summer of 2003, just months before his grand jury testimony, tested positive for anabolic steroids. Defense lawyer Allen Ruby, in his opening statement told jurors that Bonds acknowledged to the grand jury that he used the substances known as "the clear and the cream," but at the time of his testimony even investigators didn't know what was in it. Bonds told the grand jury he thought Anderson was giving flax seed oil, Ruby said. "Barry answered every question, he told the truth, he did his best and, most significantly, he provided the grand jury with useful information which supported the indictment that they later returned against the BALCO defendants," Ruby said, referring the Bay Area Laboratory Cooperative by its acronym name, BALCO. The witness list includes Bonds' ex-girlfriend Kimberly Bell, who will testify that Bonds told her he was taking steroids prior to the 2000 Major League Baseball season, according to the prosecution. "Ms. Bell will further testify to personal observations regarding changes in the defendant's body during the period of time beginning in the year 1999, including bloating, acne on the shoulders and back, hair loss, sexual dysfunction, and testicular shrinkage," the prosecution's description of its witnesses said. "She will also testify about changes in the defendant's temperament, including an increase in angry, threatening, controlling, and violent behavior." Several former teammates and friends are also on the witness list to testify for the prosecution. Ruby, in his opening statement, attacked the former friends who are expected to be called as key prosecution witnesses. "The bitterness of these people toward Barry that surfaced around the time of the breakup, was very pervasive, very strong," Ruby said. These witnesses "cooperated with the media as anonymous sources on many of the poisonous things about Barry," he said. "They have tried to create a caricature of Barry Bonds, a terrible guy, always bad, mean and so on." A former IRS agent who fished through the trash at BALCO every week for a year testified Tuesday afternoon that a magazine clipping he found in the garbage bin led him to Barry Bonds as a witness in his investigation. The article, which included a photo of Bonds with BALCO chief Victor Conte and Anderson, indicated that Bonds "was using their services," investigator Jeff Novitzky testified. Bonds holds the major league record for home runs with 762 in his 21-year career. He also set the record for most home runs in a single season in 2001 when he hit 73 balls out of the park. Bonds did not officially retire after he was indicted, but he never played another game.